Md. Rehan Uddin Chittagong, the second largest city of Bangladesh, is one of the most important cities & also one of the most earthquake-prone areas of the country. With rapid population growth over the recent years and lack of awareness about the earthquake, the unchecked development of the building environment here has been going on rapidly. Identifying buildings that have high vulnerability due to this development is of great importance both for damage estimation as well as for setting priority criteria for retrofitting. In this paper, a seismic vulnerability of the buildings of 21 no Jamal Khan ward of Chittagong city has been assessed by FEMA 154 method. Under FEMA 15 five individual parameters were surveyed by rapid visual screening & then the collected data are analyzed. Five hundred twelve buildings have been surveyed with an objective to identify the vulnerable buildings so that scoring measures can be conducted easily. A number of stories, the presence of vertical irregularity, plan irregularity, pre-code or post-benchmark, local soil condition are selected as the basic score variables. A basic score of each building is calculated considering every variable & then compared with the cut-off score 2 to determine whether the building needs further evaluation or not. After completing 512 buildings’ assessment,349 buildings are found safe whereas 163 buildings are needed for further evaluation. S.M. SajidHossain Chittagong, the south-east divisional city of Bangladesh, is one of the most earthquake-prone areas of the country. With rapid population growth over the past 30 years and no significant seismic activity during this period, the unchecked development of the city in Bangladesh has resulted in little resilience to the earthquake. Identifying buildings that have vulnerability due to this unchecked development is of critical importance both for taking preventive measures as well as for setting priority criteria for the strengthening of those buildings. In this paper, the seismic vulnerability of the residential buildings of a selected ward of Chittagong city has been assessed by FEMA-154 Method. About Seven individual parameters were surveyed under this method. Four hundred ninety buildings have been surveyed with an objective to identify the most vulnerable building. The number of stories above the ground level, soft story index, pounding effect, topographical effect, the existence of short columns, apparent building quality, local soil conditions, overhanging ratio, and normalized redundancy score are selected as the basic estimation variables. From this assessment, Falling hazard, Plan Irregularity, Vertical Irregularity, Pre-code, Post benchmark are found in 75%, 46%, 18%, 36%, and 64% buildings respectively among 490 buildings in the study area. Considering these parameters 31% of buildings are required detail evaluation. Amrita Das An experimental study on permeability and compressive strength of pervious concrete with fine aggregates Shakhawat Hossain Previous pavement is de­signed to allow percolation or infiltration of stormwater through the surface into the soil below where the water is naturally filtered and pollutants are removed. In contrast, the normal pavement is an impervious surface that sheds rainfall and associated surface pollutants forcing the water to runoff paved surfaces directly into nearby storm drains and then into streams and lakes. Firstly all the properties of aggregates have been tested. W/C ratios were 0.3 and 0.35. C/A ratios were 1:4 and 1:4.5. Besides, 6%, 8% and 10% fine aggregate of total coarse aggregate were used to prepare cubes and slabs. Then 16 cubes of size 4ʺ x 4ʺ x 4ʺ were prepared by varying those parameters. After finding out the void content, cubes were cured before the compressive strength test by UTM. After these preliminary tests, 48 slabs of size 12ʺ x 10ʺ x4ʺ were prepared by using the same parameters used for cube specimens. Later on, tests for Clogging as well as for checking permeability completed before the samples were kept for 28 days curing. Finally, after 28 days curing compressive strength tests were performed by UTM as per ASTM C39. Comparing with the conventional pervious concrete, about 47% of strength can be obtained by using fine aggregate. Considering the strength, pervious concrete can be used for residential streets, footpath cover, parking lots etc. On the other hand, previous concrete shows better performance regarding the infiltration rate even after clogging. Apu Dev Seismic vulnerabilility assessment in Chittagong city corporation area: A case study of Dewan Bazaar, ward no.-20 Abdullah Al Muhimin Chittagong is the port city and commercial capital of Bangladesh which has many activities as like of planned residential areas. With rapid population growth over the past 30 years and no significant seismic activity during this time, the unchecked development of the building environment in Bangladesh has resulted in little resilience to the earthquake. Identifying building due to this unchecked development that has high vulnerability is of critical importance both for loss estimation as a result of the unexpected earthquake and setting priority criteria for the strengthening of those buildings. One thousand five hundred and forty-eight buildings have been surveyed following FEMA 154 with an objective to identify the most vulnerable buildings. No of Story, Soft Story, Plan Irregularity, Vertical Irregularity, Pre-Code, Post-Benchmark, Soil Type are selected as the basic estimation variables. In this method, there is two discriminate functions to classify the existing buildings as “Safe” and “Unsafe”, and “requires detailed evaluation” i.e. “Unsafe groups”. According to the evaluation, 948 buildings are safe, 600 buildings are unsafe. Evaluate the effectiveness of Kadamtoliflyover using video observation and questionnaire survey Md. Niemul Hoque Chowdhury In the present study, the impact of the flyover construction to curb traffic congestion problem has been assessed in terms of traffic decongestion, timesaving, fuel saving and emission reduction. This Kadamtoli flyover has also been constructed over Kadamtoli rail crossing where traffic congestion is a big problem. Traveling on the flyover was expected to save time, loss of fuel for combustion. But in reality, few people and vehicle use the flyover. It is necessary to assess the effectiveness of Kadamtoli flyover. In the entire assessment for functional effectiveness, a field survey which is related to the origin-destination questionnaire and traffic volume has been conducted. From origin-destination survey road user responds to use flyover has been observed. Using field data which is related to traffic volume, a comparative study has been done with CDA data. From this study, it has been found that Kadamtoli flyover has failed to fulfill the road user’s requirement. The CDA forecast claiming huge cost saving does not seem to be realistic, considering the in-field reality. It appears that several modifications will be necessary for the future to make the flyover functional and cost-effective. Abu Obayed Chowdhury Improvement of Empirical Equations for Determining Coefficient of Permeability of Soil Md Akbar Hossen Mazumder The ability of soil to allow any fluid to seep through its continuous void is known as its permeability. The coefficient of permeability of a soil is required in many geotechnical engineering problems, for instance, settlement of building, the yield of well, seepage through and below an embankment, heaving in downstream of sheet pile, dewatering excavation in cohesionless soil, etc. Besides, liquefaction, while earthquake increases pore water pressure, the shear strength of cohesionless soil is reduced, relies on the coefficient of permeability of the soil. The existing empirical equations of the coefficient of permeability determination deem individual effects of soil and water physical properties, effective grain size and void ratio and unit weight and viscosity respectively. 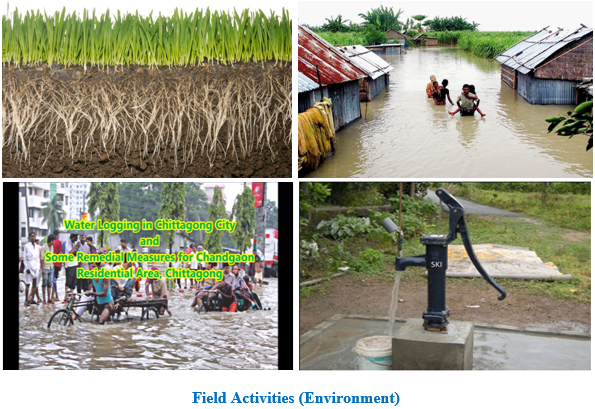 In this research, an empirical equation which accounts for the combined effect of soil and water physical properties and is based on soil samples extracted from Rahattarpul, City Gate, and Agrabad in Chittagong has been developed to determine the coefficient of permeability. If the effective grain size of soil increases while its void ratio decreases, the coefficient of permeability will be decreased. It was also found that the coefficient of permeability is proportional and inversely proportional to unit weight and viscosity of water respectively. Taslima yeasmeen Seismic vulnerabilility assessment of existing buildings in Chittagong city (Rampur, ward no.-25) Md. Helal Uddin Bangladesh is near to the boundary of two active tectonic plates & there are five active faults inside the country resulting in a great seismic threat. The probability of large scale earthquake reaffirms the importance of seismic hazard & risk analysis to estimate the consequences. In this concern, seismic vulnerability assessment is done in a City Ward of the commercial capital of Bangladesh “Chittagong City” as this city is situated just 70 km away from an active fault zone. The objective of this study is to identify the structural condition of the buildings, assess the vulnerability of buildings, estimate lives at risk etc. Ward No;25 Rampur has been chosen as the study area and surveyed using FEMA-154 RVS method. About 9 parameters like building type, soil condition, number of stories, use of the building, plan irregularity, vertical irregularity, pre-code and post benchmark, falling hazards and soft story are surveyed. To carry out the assessment total of 2019 holdings has been surveyed. Among these, 10.29% buildings require detail evaluation. On the other hand 89.71% does not need any further analysis. Moreover, presence of plan irregularity, soft storey and falling hazard are found in 28.11%, 31.05% &73.5% of assessed buildings. The research findings and results provide great scope for developing regional earthquake damage and loss studies, planning seismic hazard mitigation programs and decision making. Faria Sarreen Comparison of mechanical properties & compressive strength of concrete produced by using sand from 10 different locations of Chittagong Nur Mohammad Nabi Compressive strength of concrete is the main criteria for structural design. The compressive strength is not only influenced by coarse aggregate but also has a great influence of fine aggregate. Sand is usually used as a fine aggregate all over the world. Most of the construction works prefer using Sylhet sand as fine aggregate of concrete for greater F.M. and compressive strength of concrete in Chittagong. But huge amount of local sand sources are available in Chittagong. This study covers the influence of local sand properties on the compressive strength of concrete and to determine the highest quality and suitability of local sand. The sand samples were collected from Shilok, Rangunia, Ichamoti, Rangunia, Betagi, Rangunia, Dongnala, Rangunia, DulaHazraSafari Park, Chokoria, Adhu Nagar, Lohagara, Sripur, Boalkhali, KodalaKhal, Rangunia, Dong Khal, Rangunia and Napora, Bashkhali, Chittagong. 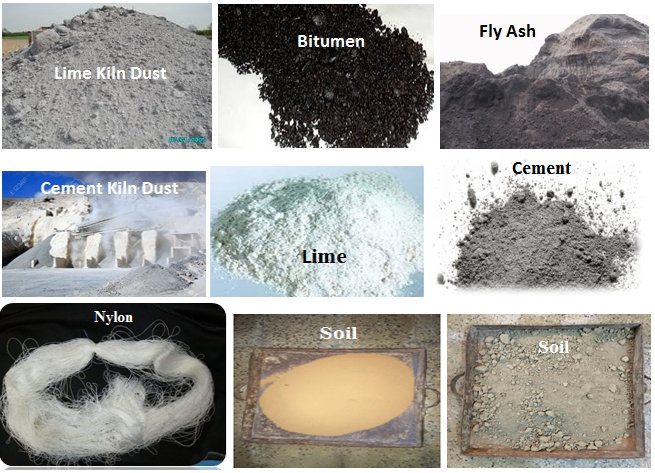 To determine the properties of local sand Sieve Analysis, Silt & clay Content test, Organic impurities test, Salinity test, Chloride (Cl-) salt test, Specific gravity test, Unit Weight determination test were conducted. Compressive Strength of (100x100x100) mm cubes were made from each sand sample with ordinary Portland cement as binding material and crushed stone as coarse aggregate at a mixing ratio of 1:1.5:3 after 7, 14 & 28 days were determined. 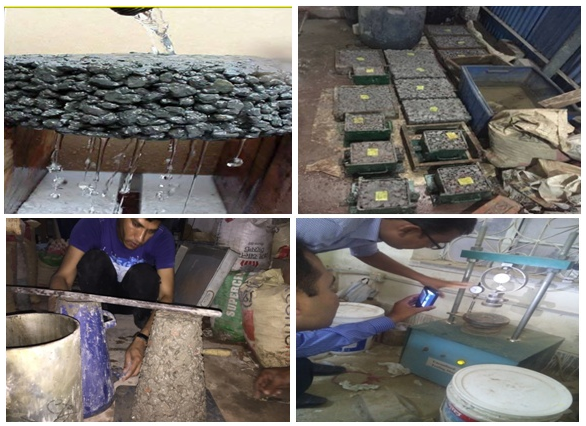 The result of the study has shown that higher F.M, unit weight, specific gravity of sand samples increases the compressive strength whereas higher silt content, organic content decreases the compressive strength of the concrete cubes. Considering all the sand properties and compressive strength of concrete, sand from Kodalakhal performs the best. Faria Sarreen Stabilization of Soil by Using nylon thread as reinforcement & Cement as binder Md. Ajgor Ali To meet the challenge of rapid urbanization major construction works are booming throughout Bangladesh. Presence of clay soil beneath the foundation of structure is subjected to settlement which is threatening to the structures. This threat can be mitigated by soil stabilization. Soil stabilization also helps to reduce the foundation cost by increasing soil bearing capacity. This project is aimed to improve soil strength using some percentage of cement and nylon thread with soil. In this study different percentage of cement (2%, 4%, 6%, 8% and 10%) by weight of soil also 2-10% nylon thread by wt. of 8% cement were mixed with the different soil sample namely river bank soil (Halda, Chittagong) and paddy field soil (Sitakund, Chittagong). Various index properties and unconfined compressive strength of soil was measured for the curing period of 7 days, 14 days and 28 days. The results showed that maximum value of unconfined compressive strength was obtained at 10% cement and 10% nylon thread by wt of 8% cement content for river bank soil and also for paddy field soil. Md. Abul Hasan Seismic vulnerabilility assessment in Chittagong city corporation area: A case study of West Bakalia, ward no.-17 Md.Yousuf Hafeez Chittagong is the most seismic vulnerable zone in Bangladesh. Chittagong has been shown under Zone II by BNBC (Bangladesh National Building Code). A strong earthquake in Chittagong may result in damage and destructions of massive proportions and may have disastrous consequences for the entire nation. There are several methods for determining seismic vulnerable assessment. The objective of this study is to find out the the vulnerable building that need to be further detailed analysis by the calculation of score in RVS method. In this regards earthquake vulnerability of 17 no West Bakalia ward is assessed. It has been assessed on the basis of potential structural vulnerability of 1087 buildings. Among these buildings with higher “S” score correspond to better seismic performance. The results of this study showed that there are about 24% buildings need detail evaluation and 76% are not required so according to FEMA-154 in West Bakalia.The West Bakalia area was found to be less vulnerable for earthquake. Due to the social impact, narrow road, lack of critical facilities and lack of preparedness among local people, a great disaster may happen even if a small scale earthquake occurs. Suprio Das Stabilization of soil by using nylon thread as reinforcement and cement as binder Shushanta Chakraborty Every engineering structure whether it is building, pavement, or bridge, dam lies on the soil. Unstable soils can create significant problems for any engineering structure. It always increases construction cost. So, having good strength of the soil is an absolute thing. This study investigates the effect of shear strength by the composition of Nylon Thread (2%, 4%, 6% & 8%) with the combination of cement (2%) on natural soil samples, collected from a construction site of 22 ShaheedMirzaLane (E), Mehedibag Road, Chittagong 4000 and a paddy land of Kulapara, Mohora, Chittagong. Both soil samples had been found as silty sand and some clays. The diameter and the tensile strength of Nylon Thread used as 0.33 mm and 30000 psi respectively. The performance of natural soil samples were evaluated using Standard Proctor test, Unconfined Compression test. It was found that the strength of natural soil increases with the increase of Nylon Thread with the combination of 2% cement. But after a certain percentage of adding Nylon Thread, the strength starts to decrease. This percentage has been found as 6% for the construction site’s sample and 4% for the paddy land sample. The percentage where strength starts to decrease has been recommended as the optimum percentage for both soil samples. The bearing capacity has been increased to a satisfactory level at the optimum percentage for both samples. Fahmida Rafiq Seismic vulnerabilility assessment in Chittagong city corporation area (A case study on east Bakalia, ward no.-19) Juwel Chandra Das Bangladesh is located at a seismically moderate zone in the world seismic map. The presence of existing fault lines around this region is capable of producing damaging earthquakes in future. No large earthquake has been recorded in these faults for many years which indicate a huge strength gathered underground that can cause serious earthquakes around the country. This paper presents a methodology to predict the seismic vulnerability of buildings by inventory survey which has been chosen as a method for Rapid Visual Screening (RVS) procedure especially FEMA 154 during the field survey to collect data for the statistical analysis based on a number of structural parameters that determined on the basis of engineering knowledge andobservations. In this regards, earthquake vulnerability of East BakaliaWardno 18 of Chittagong. It has been assessed on the basis of potential structural vulnerability of 633buildings. In these building with higher S score corresponding to better seismic performance. The result of the survey has been shown that most of the buildings in East BakaliaWard no 18 are good performance 60.51% where as another 39.49% will consider in need of further detailed evaluation. Sayma Akter Assessment on untreated ground water quality of CWASA. Sanjib Chandra Das Chittagong is the second largest city in Bangladesh and it is a premier sea port and industrialized city. The kind of population and urban growth of Chittagong is throwing tremendous challenges to the utility authority in providing utility services. Due to its economic activity, it has led to large population influx. Chittagong water Supply and sewerage authority (CWASA) is the responsible authority for supplying water .CWASA supplies two types of water to the city dwellers. That is surface water collected from Halda River and is being treated by MWTP and ground water that is being treated by KIRP. But the problem of water shortage, to fulfill the tremendous demand of water as emergency basis, near about 36.12% ground water of total ground water supplied to the city dwellers without treatment. Due to the supply of untreated water, the city dwellers may pose to serious threat of scarcity of safe water. The aim of the study was to reveal the present untreated ground water quality supplied by CWASA to measure drinking water quality parameters of CWASA deep tube well water and to find the reason of water quality deterioration. Sample of water which was collected from the CWASA pump house under MOD 2. DTW location at various point of Chittagong cities and the DTW water were analyzed in this study. The study revealed that most of the important water qualities except iron, pH, DO, turbidity, color were in the permissible limit. In every location dissolved oxygen was found less than the permeable limit at 6 mg/l. At most of the location, concentration of iron in water found more than permissible value (0.3-1.0 mg/l). Presence of color had been found in almost every location of CWASA DTW water. Concentration of iron is the main reason for presence of color in this ground water also turbidity value was higher than the permissible limit. The present studies exposes that the untreated ground water is unsuitable for drinking water in terms of iron, dissolved oxygen, color, turbidity & supply water from KIRP is unsuitable due to the high concentration of BOD. In order to avoid water contamination problem CWASA should supply treated ground water. Moreover, they should reduce dependency on ground water source and should rely on surface water source. In addition to this awareness rising and regular monitoring of water distribution have been suggested in this study. Dr. Tasnima Zannat Assessment of the Irrigation and Fish cultivation related water quality of River Karnafully Kazi Md. Rabiul Hasnat The present investigation is carried out to assess Karnafully river water quality using for irrigation and fish cultivation purpose. About 14water samples have been collected from which water is used for irrigation and fish cultivation purpose(Board Bazar, Notun Bridge, Before MorcherChor, MorcherChor, Boal Khali, ModunaGhat, Urkir Char, Lambur Hat, SarafVata, Isa Khal, MoriumNagor, Chandroghona, After Paper Mill &Kaptai lake). From every point two litters water had been collected and 19 water quality parameters had been analyzed. It is revealed from the study that water quality is deteriorated in terms of BOD, COD, EC, DO & rest of the measured parameters i.e. pH, Temperature, TDS, Alkalinity, Hardness, & Chloride, Heavy Metal, Sulphate, Phosphate, Nitrate, Salinity, Boron,Cadmium, Lead, Mercury and Calcium were within the acceptable range as per Bangladesh & World Health Organization (WHO) Standard. Dr. Hasina Iasmin Use of waste plastic coated aggregates in bituminous road construction Mosaraf Hosen Many roads agencies are experiencing problem of premature failure of pavements like potholes, roughness, cracks and etc. which leads to poor performance of roads and reduce its life. On the other hand, plastics, rubbers, etc. are increasing day by day. Waste like plastic bottles, polymers, cups, waste tires can be re-used by powdering or blending it with crusher’s and thus coated over aggregate and bitumen by any heating process. The aim of this study was to find the pavement type which would be more cost effective and would give good serviceability in the long run in the context of Bangladesh.In this paper the study of some of plastic waste materials which we can reuse by certain processing and use in road construction. The results are equipped with useful and valuable information about these materials. The discussed materials have many advantages over conventional/traditional materials and methods. This project will conduct a study on recycling plastic waste and blending it with bitumen to lay roads in India and compare with the environmental and economic conditions some of these materials are relatively cheaper and provide more strength as compared to traditional road materials. This project will come up with useful information which may helpful in creating awareness amongst the learner in the industry regarding waste material. So that one can have a step towards further detailed information about these materials and thus be able to implement at field which will definitely improve the level of construction. Dr. Hasina Iasmin Effect of guardrail in mitigation of traffic congestion: A before after study at CEPZ intersection Md. Abul Hossain Traffic congestion has now become a very serious problem particularly in metropolitan Chittagong at CEPZ Intersection. CEPZ area is the most densely populated in Chittagong city. Day by day the number is increasing and most part of CEPZ intersection is affected by huge traffic congestion. Faulty movement of heavy pedestrian, traffic rule violation, lack of planning of city road, traffic signaling systems, unplanned stoppage/parking, narrow road spaces and overtaking tendency of drivers create pro-longed traffic congestions. Due to traffic congestion, a substantial portion of working hours have to be waste on streets which indirectly put adverse impact on economy. This paper, firstly presented a simple automated image processing mechanism for detecting the congestion levels in road traffic by processing CCTV camera image feeds.The algorithm is specifically designed for traffic feeds with heavy pedestrian. Based on live CCTV camera feeds from multiple traffic signals in CEPZ, it is evident that this congestion’s collapse behavior lasts long time-periods on intersection. To partially alleviate this problem, a local de-congestion protocolhas been presented that coordinates traffic and pedestrian behavior. A simulation based analysis on simple network topologies has shown that this local de-congestion protocol can enhance road capacity and prevent congestion collapse in localized settings. At the end of the paper, it has been tried to identify the solution of traffic congestion at CEPZ intersection in Chittagong Metropolitan City. Chittagong is the most seismic vulnerable zone in Bangladesh. Chittagong has been shown under Zone II by BNBC (Bangladesh National Building Code). A strong earthquake affecting Chittagong may result in damage and destructions of massive proportions and may have disastrous consequences for the entire nation. There are several methods for determining seismic vulnerable assessment. The objective of this study is to assess the vulnerable building that need to be further detailed analysis by the calculation of score in RVS method. In this study earthquake vulnerability of 33 no. firingee bazar ward in Chittagong city Corporation has been evaluated. It has been assessed on the basis of potential structural vulnerability of 452 buildings, among 1108 buildings (without 656 tin shade buildings). The results of this study showed that the buildings in 33 no. Firingee Bazar Ward, 22% are in need of detail evaluation whereas 78% are not required according to FEMA-154. The 33 no. FiringeeBazar ward was found to be less vulnerable to earthquake. Due to social impact, narrow road, lack of critical facilities and lack of preparedness among local people, a great disaster may happen even if a small scale earthquake occurs.